Earth still holds many secrets. Despite the advances of science in the last two centuries, there are places on this planet humans have never been, and things we’ve never seen or even imagined. Many of the creatures we think we know from observing them in ‘our world’ spend the vast majority of their lives in hidden realms we have little or no access to. Inspired by the unreachable and the unknown, we’ve invented tools to help penetrate this other world – the wild – where animals live out their lives. We’ve sent surrogate machines to probe and process and have gained new understanding and appreciation for the challenges wild animals face. Increasingly, streams of digital data from animals reveal new patterns of behavior and excursions to habitats that tantalize us with virtual glimpses of how these creatures function. Yet, we have not been able to see – to directly observe – these phenomena. Until recently we’ve been constrained to infer animal behavior and ecology from secondary or tertiary data sources. In this presentation I will outline the state of the art in cutting-edge exploration and research into the hidden lives of some of the planets most extraordinary creatures (from flying lemurs to blue whales) using Crittercam – an animal-borne imaging and data logging system that captures a wild point of view. GREG MARSHALL is a biologist, inventor, and filmmaker who has dedicated his career to exploring and documenting the behavioral ecology of animals in remote or otherwise inaccessible environments. In 1986, on a research dive in Belize, Greg encountered a shark and was inspired by a remora clinging to its side. Imagining the unique perspective that suckerfish have while hitchhiking with a host, Greg conceived of an animal-borne imaging system to mimic the remora, enabling study of host species behavior. He began developing a research tool to record images, sound, and data from the animal perspective. Today this system is called “Crittercam” and Greg and his team have employed these instruments in studies of whales, sharks, seals, turtles, penguins, and other marine and terrestrial species. Crittercam enables direct observation of animal behavior over unprecedented time and spatial scales, enabling better understanding of these species and the habitats they depend upon. Greg has collaborated with dozens of science teams in studies of more than 50 species. The unique images Crittercam captures provide an intimate connection to the challenges animals face in the wild. Greg shares these images and the novel stories they convey through National Geographic films intended to inspire caring and conservation. He is a two-time Emmy Award winner for cinematography and sound (National Geographic Specials The Great White Shark and Sea Monsters: Search for the Giant Squid). Images from his research with emperor penguins were featured in the feature film March of the Penguins. He earned a bachelor’s degree in international relations from Georgetown University and a master’s degree inmarine science from SUNY Stony Brook. CNBC recently identified Greg as having one of the “World’s Coolest Jobs”. President John Ingersoll called the 2,295th meeting to order at 8:22 pm January 20, 2012 in the Powell Auditorium of the Cosmos Club. Mr. Ingersoll announced the order of business and introduced two new members of the Society, including the speaker of the evening. The minutes of the 2,294th meeting were read and approved. Mr. Ingersoll then introduced the speaker, Mr. Greg Marshall of the National Geographic Society. Mr. Marshall spoke on "CRITTERCAM: Animal-Borne Imaging." Mr. Marshall began by describing how the grand adventure of science drives us to look beyond what we know to discover the unknown and understand how we relate to the world around us. Earth is the only planet yet known to be capable of supporting life, so we need to understand how it functions and how all life is interconnected, he said. The National Geographic Society was founded at the Cosmos Club in 1888 to promote conservation and the CRITTERCAM helps accomplish this goal through the discovery, documentation, and sharing of new knowledge with as many people as possible. Mr. Marshall discussed how his fascination with the oceans and marine biology led to the development of CRITTERCAM. While researching the behavior of queen conch early in his career, he became frustrated that few people cared about the greater conservation issues and decided to make a film about the research using a custom built underwater camera system. A later encounter with a remora on the belly of a shark prompted him to imagine being able to ride along with the shark and watch its behavior after his interaction. The first prototype was developed in 1986 and tested with a captive turtle, which seemed to behave normally even with the attached camera, leading to ongoing research, development, and deployment with over sixty species since. Mr. Marshall then described the scientific subfield called "biologging," which involves deploying instruments attached to animals to understand how they move and relate with one another in their habitats. The collected data helps us put together the complex puzzle that helps sustain us all, but it is sometimes difficult to infer what the data really means without being able to see what actually happened during the data collection, he said. 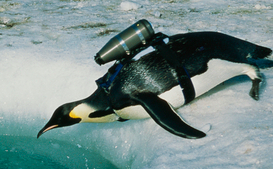 By recording video, sound, location, movement, temperature, pressure, even physiological data, CRITTERCAM helps scientists interpret data better and it is therefore a priority to make the system as useful and easy to use as possible so that it can be deployed by scientists around the world. Mr. Marshall explained that engineering and development in collaboration with researchers familiar with each species allows the optimization of each package and attachment mechanism, ranging from small patches of epoxy to dorsal fin clamps and suction cups. The systems are thoroughly tested on animals in captivity to ensure the camera has as little impact on the animal as possible and that the behavior observed after attachment will be natural. For example, when placing a camera on the side of a beluga whale to see directly into its jaws, they found the whale tended to swim in circles. He continued by describing the application of CRITTERCAM to emperor penguin feeding habits formerly examined using only time-depth information. Early researchers assumed feeding occurred deep in the freezing water and disregarded recorded depth information for visits to the underside of the ice as irrelevant behavior. When video of the behavior was recorded, it was found that the penguins were not feeding during the deep dives but instead use the position as a vantage point to look up at the ice above, hunting for silhouettes of fish that they then swim upwards to catch. Mr. Marshall then gave more examples of surprising behavioral observations that have been recorded with CRITTERCAM, including hawksbill turtle courtship, leatherback turtle mating, harbor seal foraging, sperm whale communication, and humpback whale "bubble net" feeding and courtship. He also showed examples of recordings less well understood, including puzzling alligator behavior underwater and well-fed domesticated cats hunting outside and devouring their prey. The CRITTERCAM enables research that increases the understanding of our impact on various species, allowing better planning to minimize it. He concluded by noting that many CRITTERCAM deployments provide unexpected insight and that there are still many species that we do not know much about, having been unable to directly observe them in their natural environment. There are many exciting new research possibilities and opportunities opening up as the related camera technology continues to advance. CRITTERCAM gives animals the ability to show us what is important in their lives and this perspective is critical for inspiring the public to care about the planet and its conservation. After the question and answer period, Mr. Ingersoll thanked the speaker, made the usual housekeeping announcements, and invited guests to apply for membership. At 9:59 pm, President John Ingersoll adjourned the 2,295th meeting to the social hour.